Ventura, CA 93001-2702. (805) 653-0003), from 7 to 10:00 PM. The concert is "FREE" to the public. 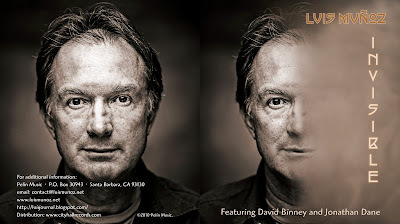 I will be performing material from the new release, "Invisible", with a sextet featuring Jonathan Dane on trumpet, Brad Dutz on percussion and marimba, Tom Etchart on bass, George Friedenthal on piano and Narciso Sotomayor on guitar. For more info, you can visit my official web site(luismunoz.net). We will also be at Soho in Santa Barbara, CA on 4/29 at 7:00 PM. Remember, the concert is free, so, first come, first serve. Hope to see you all. Best! Luis. With old friends from Costa Rica: Narciso Sotomayor, Brett Harter and William Salas, plus Wyse LA Kid. Last time I saw Willy and Brett was in 1975. This image, which will be in the cover of my new CD, was created from a photograph taken by the wonderful young Costa Rican photographer Agustín Vicente Fallas who is doing great stuff with his camera and imagination! All set up and ready to go for today's performance at SOho in Santa Barbara, at 1:00 PM! Soho: 1221 State Street, Santa Barbara, CA. 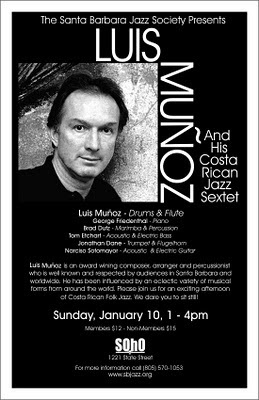 Luis will be performing music from his upcoming CD "Invisible", to be released in February of 2010. I am riding my new scooter that I won in a raffle the day before Christmas. I am by the beach in beautiful Santa Barbara, CA on a perfect January "Summer" day (70 degrees). First time I ever win anything, and I am going to make sure I enjoy it!!! !